The Fairlane got some end of season maintenance recently…oil change and filter. Right after that I had the front suspension rebuilt by a local shop, which greatly improved steering and handling. Pictures to follow when I get it back up in the air. New upper and lower control arms including bushings, tie rod ends, springs, sway bar links and sway bar bushings, etc. David Pearson drove this body style Ford in the 1968 and 1969 season. David Pearson, a three-time NASCAR Cup champion and winner of 105 races in NASCAR’s premier series, died Monday. He was 83. The Wood Brothers Racing team announced his death, but details were not immediately available. Pearson advanced from the short tracks of the Carolinas to the fastest superspeedways of NASCAR and was one of the sport’s biggest names in the 1960s and 1970s. His Cup win total is second only to Richard Petty, and he won the Cup championship in every season in which he raced for it (1966, ’68 and ’69). Pearson is survived by three sons, Larry, Ricky and Eddie, all of whom have been involved in NASCAR racing. His wife, Helen Ray, died in 1991. “David Pearson’s 105 NASCAR premier series victories and his classic rivalry in the 1960s and ’70s with Richard Petty helped set the stage for NASCAR’s transformation into a mainstream sport with national appeal,” said NASCAR Chairman and CEO Jim France. “When he retired, he had three championships — and millions of fans. The man they called the “Silver Fox” was the gold standard for NASCAR excellence. In the 1960s, Pearson and his three main competitors — Bobby Allison, Cale Yarborough and Petty — were largely responsible for beginning the process that grew NASCAR from a mostly Southeastern sport into a national phenomenon. Their battles ignited fan interest and partisanship and attracted the early interest of television. The Pearson-Petty rivalry was electric. They finished one-two in Cup races 63 times, with Pearson winning 33 of those challenges. Pearson and Petty were the stars of perhaps the greatest finish in NASCAR history — the 1976 Daytona 500. They were racing for the victory on the final lap when their cars touched in turn four, contact that sent both crashing into the outside wall. Both cars came to a stop on the infield grass, but Pearson depressed the clutch in his Mercury during the wreck, keeping the engine running. He chugged across the finish line at about 30 mph to win the race. Pearson’s journey to that time and place began at the now-defunct Piedmont Interstate Fairgrounds dirt track in his hometown of Spartanburg, S.C. As a teen-ager, Pearson climbed a tree outside the track fence to watch a race and decided he had discovered his future. Pearson started racing on local short tracks in 1953 and quickly built a reputation as a smart and daring wheelman. His time working in the Whitney textile mill near Spartanburg was over. He moved into Cup racing in 1960 and was named rookie of the year. In 1961, car owner Ray Fox offered Pearson a shot in his Pontiac for the World 600 at Charlotte, and Pearson made the most of the opportunity, scoring his first series win. Later, he said he figured he was as good as anyone else on the track. I’d have to say if their was one driver who inspired me the most on the race track it was you. Always gritty, witty and in position at the end when it counted. Pearson won other big-track races at Daytona and Atlanta that season, and his future was set. He went on to win series championships with the Cotton Owens and Holman-Moody teams, then moved to Wood Brothers Racing in the 1970s to form one of the greatest partnerships in the sport’s history. In 1973, Pearson won 11 of 18 races in the Woods’ No. 21. More than a few drivers, including Petty, have described Pearson as the best driver they ever raced against. “I have always been asked who my toughest competitor in my career was. The answer has always been David Pearson. David and I raced together throughout our careers and battled each other for wins- most of the time finishing first or second to each other. “It wasn’t a rivalry, but more mutual respect. David is a Hall of Fame driver who made me better. He pushed me just as much as I pushed him on the track. We both became better for it. Member of NASCAR Hall of Fame, inducted in 2011; National Motorsports Press Association Hall of Fame, International Motorsports Hall of Fame in 1990; and numerous others. Named one of NASCAR’s 50 greatest drivers in 1998. Won 11 consecutive pole positions at Charlotte Motor Speedway from 1973-78. 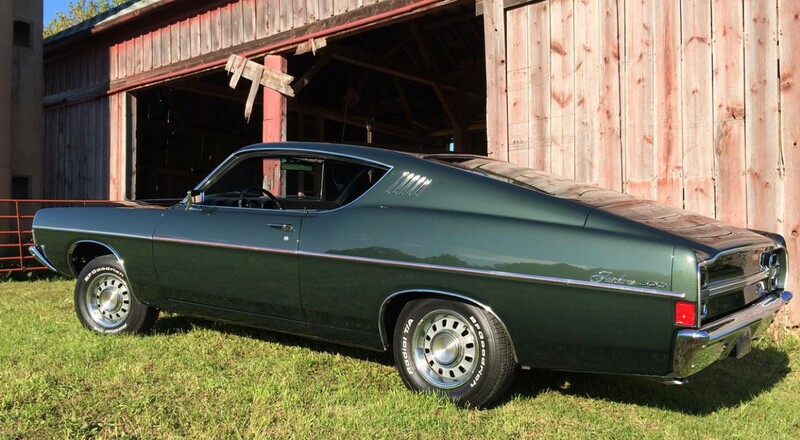 This 428 convert is the same color as our old 1969 Fairlane 2 door hardtop back in the day. Looks like I’m all set on the ground floor! 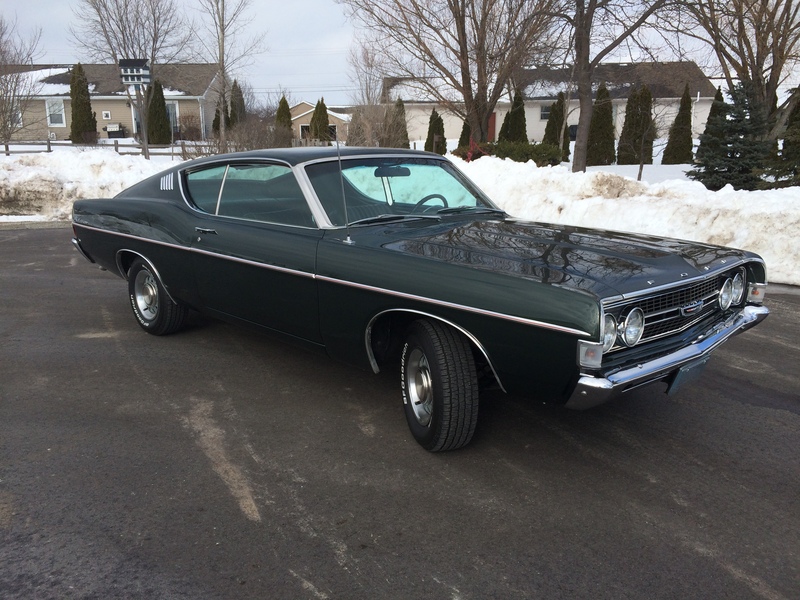 It’s getting toward the end of the season but today was a nice sunny day, good for a little ride in the Fairlane over by Lake Winnebago. Here is my car at the 2018 Fairlane Club of America convention in Dayton, Ohio. 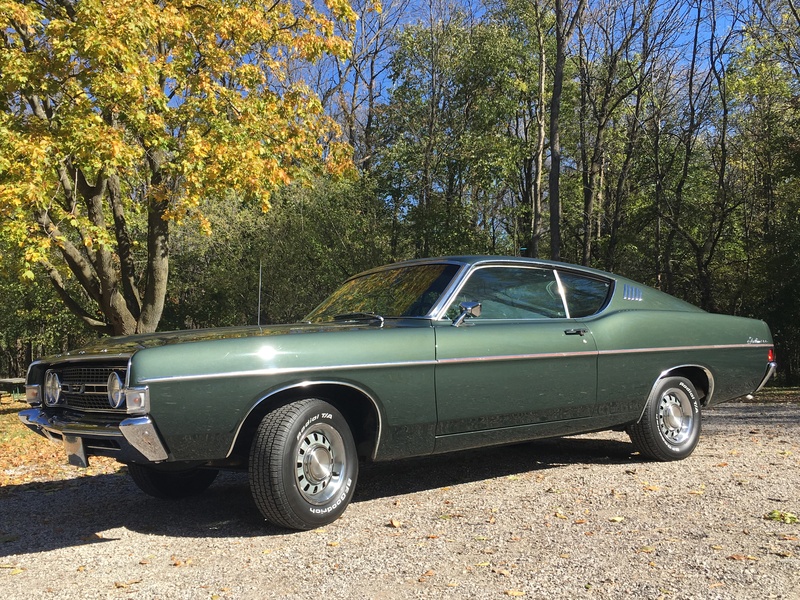 It was one of only 6 1968 Fairlane Fastbacks, the only 1968 Fairlane Fastback with a 4 speed, the only one wearing its original aluminum trim (not Torino C-stripes), and the only car painted in the beautiful Highland Green color! As ordered, my car would have listed for $3,325.86, roughly $24,100 in 2018 dollars. (Base price $2648.19 plus options). 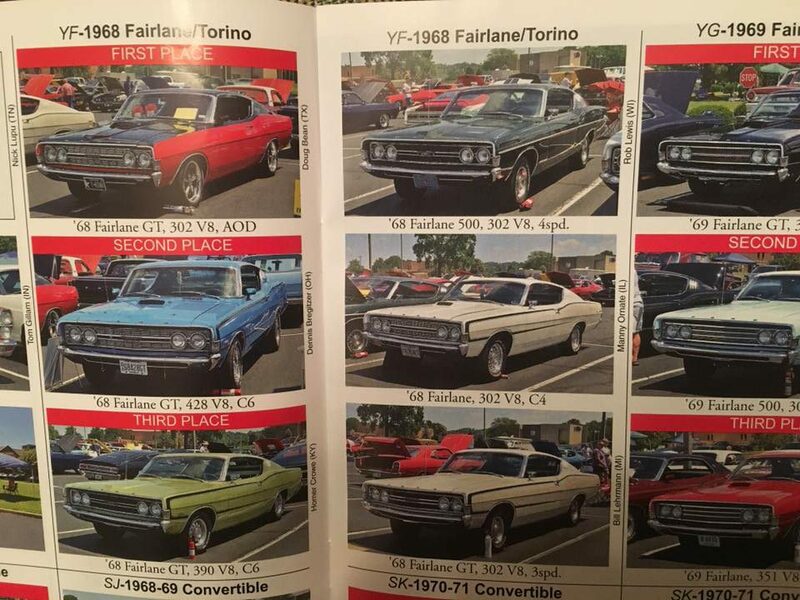 How many full sized new cars with a V-8 engine and a four-speed can you buy for 24 grand these days?